Making a cash deposit to your online bank account is going to work a little differently than when you make a deposit at your traditional bank. 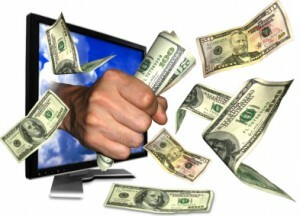 Since obviously you cannot send a check or cash directly from your computer, other methods will need to be used. These methods can vary depending on your online bank. For example if you have an online bank account that is linked to your traditional bank you could make a deposit at your traditional bank and then transfer it to the online bank account. However if you don't have an online bank account that's linked to your traditional bank account you will have to use other methods to make your deposits. Let's take a look at some of your options. 2) Setup direct deposit with your employer or pension checks. 3) Make a deposit at ATM. Many online banks have now made arrangements with other companies that own ATM's. This allows you to make a deposit using the ATM but there will likely be a small fee. However if you need the funds available right away, this is your best option. Getting funds out of your online bank account is not a problem as you can always withdraw money from an ATM. In this case you may also pay some small fees unless your bank has made some arrangements with the ATM owner. If your online bank is linked to your traditional bank you should be able to use their ATM to withdraw funds without incurring any fees. For example you may be out shopping or at a movie and need some spending money. No problem just find an ATM and you can be on your way in no time with your cash in hand. Online banking has many advantages, but like most things it's not perfect. So you will need to be willing to accept that if your mailing in a check there will be a delay in funds being available or accept the fact that you will pay some small fees for using an ATM. Overall these things should not be considered major concerns.